'His political journey gives reason to believe that 2019 will be another milestone in his private project,' notes Vikram Johri. Reactions to former prime minister Atal Bihari Vajpayee's death reconfirmed the huge popularity the leader enjoyed not just among the Bharatiya Janata Party cadre but a vast swathe of the political leadership. His funeral procession through Delhi was reminiscent of the sort of public grief usually associated with the passing of South Indian thespians. Tears flowed freely at the subsequent shraddhanjali sabha organised by the government. Opeds written in the aftermath of Vajpayee's death have focused on his political and economic legacy, the first characterised by his large-heartedness, most notably on Kashmir, and the second by his determination to take forward the reforms unleashed by P V Narasimha Rao nearly a decade before Vajpayee's term as prime minister. From telecom to IT, highways to electricity, it was repeatedly pointed out that we are reaping the fruits of the seeds sown by him. The dichotomy of his immense popularity and good governance on the one hand and the BJP's drubbing in the 2004 polls cannot be overstressed. Even Vajpayee's fiercest critics must have been dumbstruck by that loss, given the long, hard road he and L K Advani, his deputy in the party and government, took to bring the BJP to the fore. That loss will not easily be forgotten in the BJP, which is quick to point out that the subsequent United Progressive Alliance dispensation diluted -- and worse -- the promise of the National Democratic Alliance years. The prospect of defeat, in spite of an acknowledged track record in government, must particularly roil Prime Minister Narendra Damodardas Modi and BJP President Amit Anilchandra Shah as they look to avoid that outcome next year. Modi is arguably as popular as Vajpayee, but his popularity is of a decidedly different hue. Vajpayee was known and celebrated for his expansiveness. Both Mamata Banerjee and Mehbooba Mufti, who are unlikely to say kind things about Modi, heaped praise on Vajpayee after his death. Vajpayee the poet was indistinguishable from Vajpayee the politician, a factor that may have contributed to the inertia that led to the 2004 outcome. Modi's popularity has a more deliberate sheen. Unlike Vajpayee, he gives the impression of carving out a mandate in his favour. One example of this is his willingness to go after others in the political class. In popular perception, the cases against Lalu Prasad and P Chidambaram's son could not have proceeded without his go-ahead. Another instance of this doggedness is the army's renewed push in Kashmir to smoke out Pakistan-funded terrorists. Modi is also careful not to give the impression that his government is only working for the rich, an unfortunate correlation for any leader who seeks to reform economic policies. The rural push undertaken by his government, including Jan Dhan, housing and the provision of LPG, is one part of that story. The government's going after the likes of Vijay Mallya and the exercise of demonetisation feed into a larger narrative of an administration keen to reform a plutocratic system. The most crucial point of difference between the two leaders, however, may lie in their worldviews. Modi is willing to raise questions -- such as the need to reform Muslim law -- that Vajpayee avoided. Aware of his reputation and that of his party, he is cautiously tackling issues around minority rights that have long vexed the Indian polity. The flip side is that to this day, he has not expressed regret for his inability to prevent riots in Gujarat under his watch. Such silence would be unthinkable from Vajpayee. Finally, Modi and Shah run an electoral machine unrivalled in the history of Indian politics. While Modi's popularity has some role to play in the string of victories the BJP has enjoyed since 2014, Shah's micro-management must share the credit. 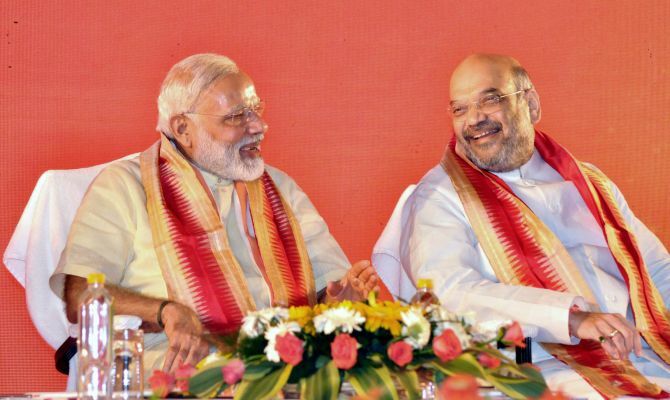 Obsessed with numbers, the duo has been making inroads into traditionally BJP-averse areas like Bengal and Kerala to make up for any seats the party may lose in the Hindi heartland. Vajpayee was too retiring a man to lose sleep over panna pramukhs. It is for these reasons that Modi is likelier to return to power next year than Vajpayee was in 2004. Vajpayee was a multidimensional man who was nevertheless predictable in his ways. Modi is a schemer, possessed of a shrewdness that can be rewarding in the chaotic world of politics. His political journey thus far gives reason to believe that 2019 will be another milestone in his private project.